Samsung Ultra HD Blu-ray player to cost "under €500" | What Hi-Fi? 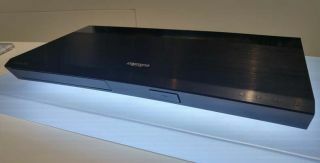 Samsung Ultra HD Blu-ray player to cost "under €500"
The world's first Ultra HD Blu-ray player is likely to go on sale in spring 2016 with a price tag "under €500" according to a Samsung spokesman. Samsung stole a march on its 4K opposition with the announcement of the world's first Ultra HD Blu-ray player, the UBD-K8500, at IFA in Berlin yesterday. Information on the release date of the UHD Blu-ray player was vague, while there was no word at all on pricing, but a Samsung spokesman at IFA tells What Hi-Fi? it's likely the UHD Blu-ray player will be released in Spring 2016 and cost under €500 (£365). Back in May, Ron Martin, VP of Panasonic Hollywood Laboratory, had told What Hi-Fi? that 4K disc players were likely to be "two to three times the cost" of existing Blu-ray players, so this seems to fit with that information. The Samsung UBD-K8500 player supports HDR, the HEVC codec, 10-bit colour depth and has a "UHD Up-scaler" for non-4K video. 3D is also mentioned, despite not being part of the official spec, so we assume this means it will play standard 3D Blu-ray discs. Other features on the player's spec sheet include a "Multiroom Link", dual band WiFi (2.4GHz / 5GHz), Samsung's Smart Hub, Screen Mirroring and a web browser. There's a USB connection, which promises "Disc to USB", plus a digital optical output. We'll go ahead and assume there's an HDMI output on there, too. After an increasing amount of noise around Ultra HD Blu-ray this year, the Samsung UBD-K8500 is the first sniff of any hardware that we've had. We also saw the first 4K discs, with the Ultra HD Alliance confirming Kingsman would be the first release and 20th Century Fox promising all its releases would be on Ultra HD Blu-ray as soon as the products were in market. Martin suggested back in May that 4K discs would be "price comparable to existing Blu-rays". Despite Panasonic's desire to be first to release an Ultra HD Blu-ray player, there's been no sign as yet of any UHD Blu-ray hardware from Panasonic, nor any other manufacturer, at IFA.